After spending much of the time since last Sunday glued to the television and listening to radio reports about the devastating fires throughout Southern California and trying, with only marginal success, to contact friends and relatives in the fire zones, I feel like I've been pulled through an emotional knot hole. We have many friends who live in or around the affected areas, some of whom evacuated and others who chose to hunker down and see what happened. That latter is not advised and we're keeping our fingers crossed that their decision doesn't come back to bite them. Since Monday I've tinkered with a blog entry to address this subject, but kept bumping up against statistics that were accumulating so fast that it was just overwhelming. Fortunately, our pal Art Pedroza over at the Orange Juice! Blog has been doing a daily update. If you click here you can go to that blog and scroll down through his summaries and the links he's provided. The articles and images will give you all the information you need on our situation out here. Art's done an amazing job on this subject all week. Kudos to him. In his most recent entry he included a link from The Cycling Dude blog which addresses riding bicycles in this smoke-filled environment. Click here for that link. The scope of these fires and the tremendous efforts made to combat them are staggering. The images of helicopters, Super Scoopers and that huge DC-10 tanker dropping water and fire retardant all over our region for the past five days have been amazing. Stories of firefighters going for 36-48 hours without sleep, trying to protect homes and lives, makes you realize how much we owe to those heroes. One number I heard this afternoon that rocked me - 25% of the land area of San Diego County has been burned in this set of fires! That's an astounding number, which only compounds the half million residents displaced at least temporarily and more than 1500 homes that have been destroyed. 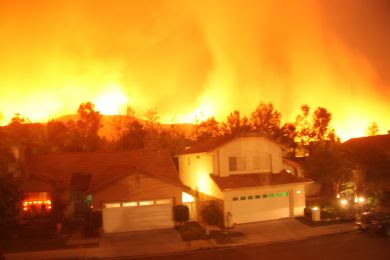 Those of us in Orange County are dealing with the fact that the Santiago Fire - "our" fire - was caused by an arsonist. This fact heaps even more emotional grief onto an already terrible situation. To date, more than $150,000 in reward money has been made available for information that leads to the arrest and conviction of the arsonist. Among the many frustrating situations being faced here has been the wind - then the lack of it. When the fires first started winds were being clocked in some places at over 100 miles per hour, with constant winds well over 50mph in many places. This made it almost impossible to contain the fires - the wind-driven embers simply jumped fire lines and started new fires miles away. At one time during the past three days there were nearly 30 separately identified fires burning from the Santa Inez Valley north of Santa Barbara to the Mexican border. Today there is very little wind, which some would cheer. However, because the entire region is covered with thick, acrid smoke, some of the most effective air assets cannot be used because the pilots cannot see! What we need is a little breeze from somewhere to move the smoke around a little so the big guys can get back into the game. It's going to take more than a week for most of the fires to be contained based on recent reports. I doubt we will have full containment of all the fire locations until well into November and probably won't have meaningful statistics until Thanksgiving. Thanks to each of you who have expressed concern for us out here on the Doorstep of Hell. Thanks to those of you who have chosen to contribute to the various relief organizations helping the newly homeless from these fires. Thanks to the emergency personnel - the firefighters, police, National Guard and the countless volunteers who continue to provide support to the evacuees. Thanks to you all. In the midst of trying to figure out how much of Southern California remains unburned, I submitted a letter to the editor to the Daily Pilot addressing the subject of Costa Mesa City Attorney Kimberly Hall Barlow's recent letter published on those pages. You can read her letter here. The Pilot published a version of my letter this morning. It was edited for space and to correct what they thought were errors. Unfortunately, their "fixes" only further complicated things. For example, I misspelled the judge's name in the last sentence of my submission. They "fixed" that problem by misspelling it another way! 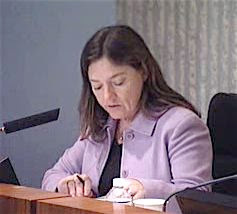 I read Costa Mesa City Attorney Kimberly Hall Barlow's "Sounding Off" commentary, (Peelman's missed oath doesn't negate his principles), published on these pages October 20, 2007 with great interest. Her attempt to clarify the role of Peelman as "our prosecutor", while thorough, left me with a few questions. When she says, "The City Council does not determine who gets prosecuted, nor does it direct what charges may be pursued, when and under what circumstances charges will be filed, whether a case should be dismissed at some point in time during its course, or whether to appeal a decision adverse to the people. ", I find myself wondering just who works for whom? In the dismissed Acosta case the City Council held numerous closed session meetings over many months in which the case was discussed. Are we to believe that these sessions were "one way streets", with Barlow telling the council what is happening without the opportunity for the council - her boss - to "provide direction"? If that's the case, what happens in the pending federal case filed by Acosta against Mayor Mansoor, Chief Hensley and The City if the defendants wish to try to find common ground for a settlement? Will the attorney ignore that direction if he feels his case is strong? I certainly don't pretend to have legal training and I'm not being critical here, I just want to know how this "system of justice" is supposed to work. I want to know just how much authority, responsibility and influence our elected officials have in this kind of a situation. It sounds like Ms. Barlow is saying, "none, none and none." When Ms. Barlow tells us that Mr. Peelman, her associate from Jones & Mayer, should not be taken to task for failing to meet a legal requirement for a prosecutor - which caused the Acosta case to be dismissed - I become concerned. If Mr. Peelman is not responsible for this gaffe, who is? Is the judge responsible because she enforced the rule? Is the defense attorney responsible because she brought it up? Who do we, the people, look to as the party responsible? Even though I hold Ms. Barlow in high regard, this sounds just a teeny bit self-serving. Ever since Jones & Mayer was contracted to perform the job of Costa Mesa City Attorney, represented primarily by Ms. Barlow, it appeared to me that we were getting good return on that investment. We, the residents of Costa Mesa, really can't judge that, though, since much of what happens occurs behind closed doors. We are not privy to the legal advice she provides, nor the council's questions of her. We don't know whether she frequently has to rein them in to avoid costly legal problems or not. We are left only to judge by the outcome - as in the Acosta case. Despite Ms. Barlow's excellent account, based on letters and postings on the Daily Pilot blog, there are many people in this community who still find it curious that charges were filed by the prosecutor for the city after the District Attorney's office chose not to do so, and that those charges were filed only after Acosta filed his federal case. Whether it is or is not the case, it looks like we, the city, chose to try to teach Mr. Acosta a lesson - to show him his proper place - for acting in a disrespectful manner towards the mayor at the earlier meeting in December of 2005. It looks like we were willing to spend thousands of taxpayers dollars on a case that would generate $1,000 in fines. None of that, in my opinion, makes our city look very good. Ms. Barlow ends her commentary with the following statement: "Whether you agree with the decision to prosecute Acosta or with the judge's order dismissing the case, the guiding principle for every prosecutor remains the same. Swearing one more oath does not and cannot change that." Well, apparently Judge Kelly MacEachern felt differently, so who are we to believe? That it - the way I submitted it to the Pilot which was sliced and diced to fit their pages and, apparently, to tone it down a little bit. I don't know about you, but I'm not very comfortable with the way this situation has evolved. In my opinion, Kim Barlow shouldn't have published her letter. It only served to rip a scab off a festering wound and ended up generating more questions than answers.